Over the last four years, I've been exploring the world of big data, building real-time and batch systems at scale. 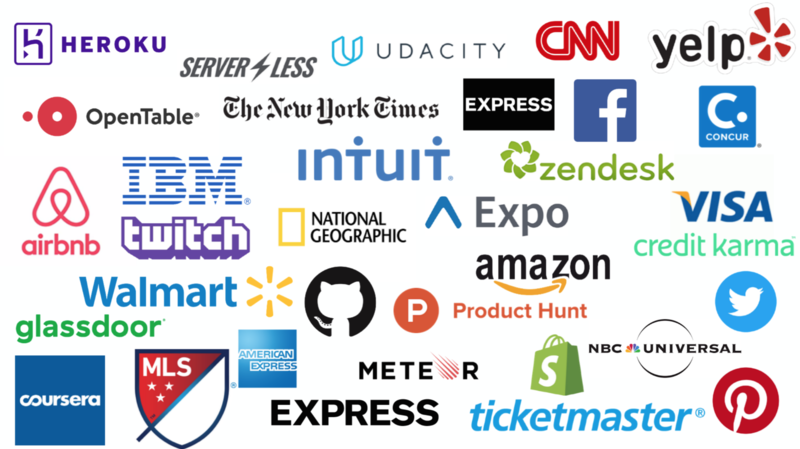 For the last couple of months, I've been developing products with serverless architectures here at Glassdoor. 1) How can we build low latency APIs to serve complex, high dimensional and big datasets? 2) Using a single query, can we construct a nested response from multiple data sources? 3) Can we build an endpoint which can securely aggregate and paginate through data and with high performance? 4) And is there a way we can do all of that at scale, paying only for each query execution, and not for idle CPU time? The answer for us ended up largely being GraphQL. This post aims to show you how you too can streamline your existing workflow and handle complexity with ease. While I won't be digging deep into specific things Glassdoor was working on, I will be showing you a pretty related example that utilizes a mini Twitter clone I made. Ready to talk about creating Serverless GraphQL endpoints using DynamoDB, RDS and the Twitter REST API? Ready to see a sweet performance comparison? Ready to hear some solid techniques on how you can convince the backend team that using GraphQL is a great idea? I’m going to start this off by stating a fact: The way we currently build APIs, as a collection of micro-services that are all split up and maintained separately, isn’t optimal. If you're a fellow back-end or front-end engineer, you're probably familiar with this struggle. Luckily for us, the tech horizon is ever-expanding. We have options. And we should use them. GraphQL lets you shrink your multitude of APIs down into a single HTTP endpoint, which you can use to fetch data from multiple data sources. In short, it lets you: 1. Reduce network costs and get better query efficiency. 2. Know exactly what your response will look like and ensure you're never sending more or less than the client needs. 3. Describe your API with types that map your schema to existing backends. You are absolutely correct: with one HTTP endpoint, you need to be entirely sure that endpoint never goes down and that it scales on demand. That’s where serverless comes in. Serverless has gained popularity over last few years, primarily because it gives developers flexibility. What makes Serverless and GraphQL such a great fit? When moving to GraphQL, you suddenly rely on one HTTP endpoint to connect your clients to your backend services. Once you do decide to do that, you want this one HTTP endpoint to be: reliable, fast, auto-scaling and have a small attack vector regarding security. All these properties are fulfilled by a single AWS Lambda function in combination with an API Gateway. It’s just a great fit! In sum, powering your GraphQL endpoint with a serverless backend solves scaling and availability concerns outright, and it gives you a big leg up on security. It’s not even that much code or configuration. It takes only a few minutes to get to a production-ready setup, which we're about to dive into, right now. With the shiny new Serverless and GraphQL Repository, it’s incredibly straightforward to get your HTTP endpoint up and running. Note: I’m going to focus on AWS Lambda below, but know that you can use any serverless provider (Microsoft Azure, Google Cloud Functions, etc.) with GraphQL. To create this endpoint, I'm going to be using the Apollo-Server-Lambda package from npm. (You can also use Express, Koa, or Hapi frameworks but I prefer less complexity and more simplicity). Also, to make your endpoint production ready, you might want to integrate the lambda function with Cloudwatch-metrics, AWS X-Ray or Apollo Engine for monitoring and debugging. handler.js: lambda function handler to route HTTP requests and return the response. serverless.yml: creates AWS resources and sets up the GraphQL endpoint. schema.js: defines our GraphQL schema we're using to build this mini Twitter app. resolver.js: defines query handler functions to fetch data from our other services (RDS, REST, DynamoDB, etc.). We'll be using the Serverless Framework to build and deploy your API resources quickly. If you don't have the Framework installed, get it with npm install serverless -g.
Now, any HTTP POST event on the path /graphql will trigger the graphql Lambda function, and will be handled by graphqlHandler. In your Lambda function, GraphQL Schema and Resolvers will be imported (as I'll explain further in a minute). Once API Gateway triggers an event, the graphqlLambda function will handle it. The response is sent back to the client. Still with me? Great. Let's dive deep into how Lambda retrieves data from DynamoDB, RDS and, the REST backend. We'll use the getUserInfo field as an example. This field takes a Twitter handle as input and returns that user's personal and tweet info. First, we'll create two tables (Users and Tweets) to store user and tweet info respectively. We'll also be using Global Secondary Index (tweet-index) on Tweets table to sort all user tweets by timestamp. At this point, you'll need to mock fake data using Faker. You'll also need to make sure your IAM Roles are set properly in the serverless.yml, so that Lambda can access DynamoDB. These are defined in the serverless.yml file in the repository. If you're interested in knowing more about IAM permissions, here's an excellent primer. Let's set it up for getUserInfo to retrieve data from DynamoDB. I'll be breaking down the code for you. Then we'll query the DynamoDB table index, tweet-index, to retrieve paginated tweets for a given user handle. Passing the nextToken parameter implies paginating through the result set, which is passed as ExclusiveStartKey. Let's test it out locally and then deploy it to production. To test the GraphQL endpoint locally on my machine, I'm using these three plugins for the Serverless Framework: Serverless Offline, Serverless Webpack and Serverless DynamoDB Local. These plugins make it super easy to run the entire solution E2E locally without any infrastructure. It will also help us debug issues faster. Note: We also have a previous post on making a serverless GraphQL API, which covers the process in more detail. DynamoDB is great for fetching data by a set of keys; but using a relational database like RDS will provide us the flexibility to model complex relationships and run aggregation mechanisms at runtime. Let's look at the process of connecting your Lambda to RDS. 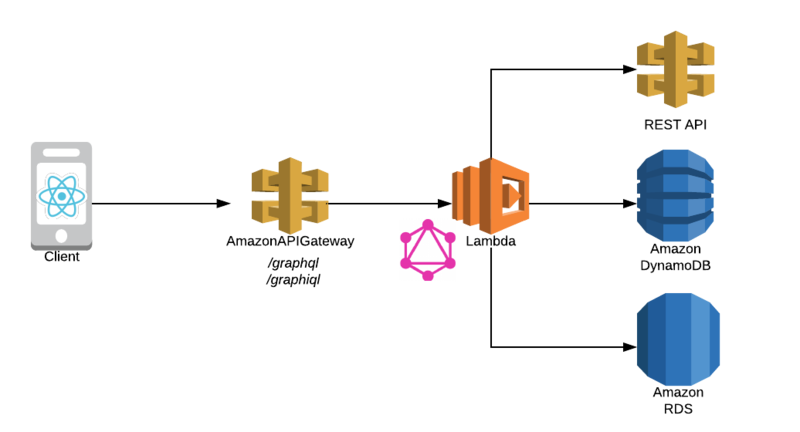 We have explained the requirements to set up RDS in production in the readme, but you can test your GraphQL endpoint locally using SQLite3 (without any AWS infrastructure). Boom! We will create two tables (Users and Tweets) to store user and tweet info respectively, as described here. Then, you'll need to use Faker again to mock some fake data. Set your Lambda in the same VPC as RDS for connectivity, and configure knexfile for database configuration in development and production environment. Let's go ahead and write our resolver functions. The knex ORM layer queries the User table to resolve getUserInfo and returns a list of user attributes. Then, we join both Tweets and Users tables on user_id to resolve tweets. In the end, topTweet is returned using where, limit and orderBy clauses. Run it locally on your machine (RDS instance not required). Note: When running in production, please make sure your database endpoint is configured correctly in config/security.env.prod. Last but not least—it's time for the REST API backend! This use case is the most common when you have pre-existing microservices, and you want to wrap them around GraphQL. Don't worry; it's easier than you think. We'll fetch data from Twitter's REST API, but it could very well be your own REST API. You'll need to create OAuth tokens here, OR use these test account tokens for faster setup. In this case, we don't need to create tables or mock data because we will be querying real data. Let's look at how to resolve following field to find a list of Users being followed. Note: A complete example is given here. You can also check out Saeri's walkthrough on building a Serverless GraphQL Gateway on top of a 3rd Party REST API. If you are new to the ReactJs + Apollo Integration, I would recommend going through these tutorials. The code for apollo-client in the serverless-graphql repo is here. Now, make sure http://localhost:4000/graphiql is working. In production, you can also deploy the client on Netlify or AWS S3. Please follow the instructions here. Which brings us to the best part. Let's dive into the performance of our Serverless GraphQL endpoint. Baseline Dataset: 500 Users, 5000 Tweets (10 tweets per user) where each user record is less than 1 KB in size. Region: All the resources were created in aws us-east-1, and API calls were made from 2 EC2 nodes in the same region. I simulated 500 users making the API call with a ramp-up period of 30 secs hitting two separate GraphQL endpoints (one with DynamoDB and the other one with PostgreSQL). All the 500 users posted the same payload; there is no caching involved for this analysis. For 99% of the simulated calls, DynamoDB took less than 15ms; but 1% of the calls had high response times which resulted in overall avg latency of 25ms. 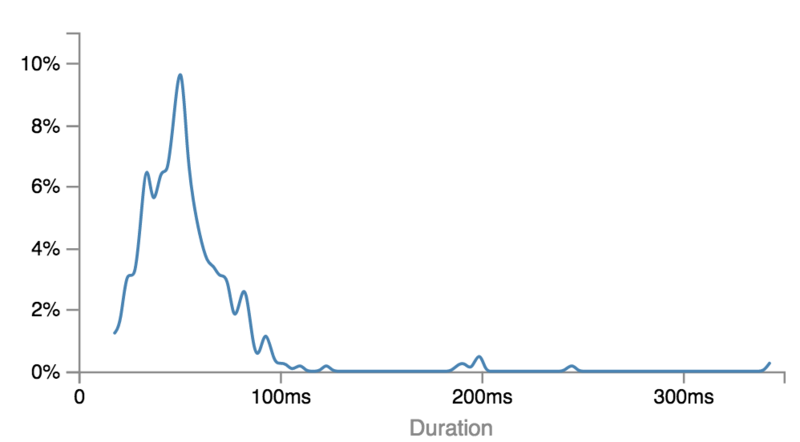 The Lambda execution time was 60ms; the time spent on the Lambda service itself was 90ms on average (we can optimize the Lambda execution time, but not service time itself). Approximately 2% of the total calls were cold starts. I noticed an additional latency of 700ms-800ms in Lambda execution time for the first API call, which came from initialization of the Lambda container itself. This additional latency was observed in both endpoints (DynamoDB and PostgreSQL). There are ways to optimize this overhead, and I would strongly recommend you to read up on them here. Increasing the lambda memory size by 2x (2048 MB) improved the overall latency of the Lambda service by 18%; increasing by 3x (3008 MB) improved the latency by 38%. With RDS, the Lambda execution time increased along with the size of the data. When I increased the Tweets dataset by a factor of 100 (to 1000 tweets per user), I found the response time increased by 5x-10x. This possibly happens because we are joining the Tweets and Users tables on the fly, which results in more query execution time. Query performance can be further improved by using indexing and other database optimizations. Conversely, DynamoDB latency remains constant with increasing dataset size (which is expected by design). 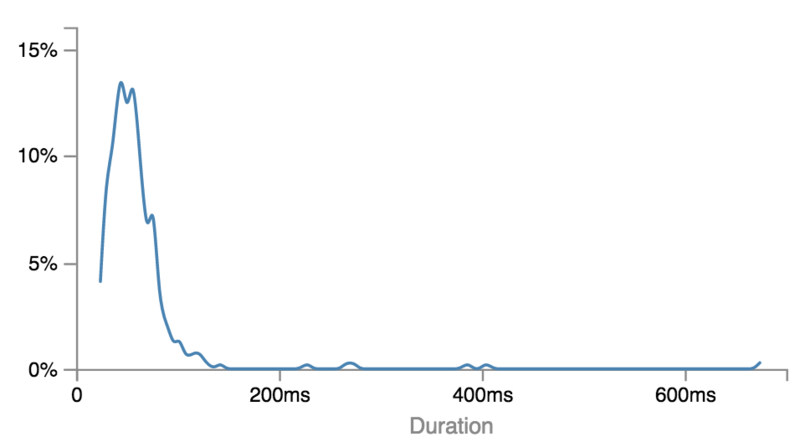 On average, the E2E response time of the GraphQL endpoint ranges from 100ms-200ms (including the Lambda execution time). Hence, on API Gateway the network latency is approximately between 40-100 ms, which can be further reduced by caching. You might ask, "Why do we need API Gateway? Can't we just use Lambda to fetch the GraphQL response?" Well. This analysis truly merits a separate blog of its own, where we can do an in-depth study of all the latencies and query optimizations. Or you can also read this forum discussion about it. Ready to switch everything over, but not sure about how to convince the backend team? Well, here’s how I’ve seen this play out several times, with success. First, the frontend team would wrap their existing REST APIs in a serverless GraphQL endpoint. It added some latency, but they were able to experiment with product changes way faster and could fetch only what was needed. Then, they would use this superior workflow to gain even more buy-in. They would back up this buy-in by showing the backend team that nothing had broken so far. Now I’m not saying you should do that, but also, if you wanted to, there it is for your consideration. My lips are sealed. First of all, I would like to thank Nik Graf, Philipp Müns and Austen Collins for kickstarting open source initiatives to help people build GraphQL endpoints easily on Serverless platforms. I have personally learned a lot during my work with you guys! I would also like to give a shout to our open source committers - Jon, Léo Pradel, Tim, Justin, Dan Kreiger and others. Thanks Andrea and Drake Costa for reviewing the final draft of this post and Rich for helping me out with questions. Last but not the least, I would like to thank Steven for introducing me to GraphQL. I hope you guys liked my first blog post! Feel free to reach out and let me know what you think. Sid Gupta is Lead Data Engineer at Glassdoor. How SC5 used Serverless to create the backend for a revolutionary transportation app.